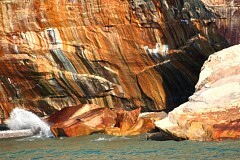 H - Munising Michigan (Painted Rocks Lakeshore). We left Mackinaw City and drove across the Mackinac Bridge to the Upper Peninsula. We viewed upper Lake Michigan then headed north to hit Lake Superior. Experts expect Lake Superior's water level to to reach a record low level this fall. 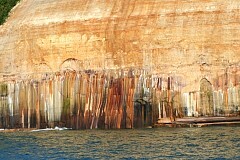 When we got to Pictured Rocks Cruises in Munising, Michigan it was late in the afternoon. 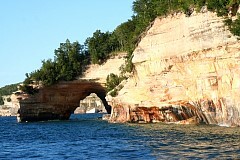 This is the easiest way to see Pictured Rocks. Our tour boat heads out into Lake Superior. We sat on the right side of the boat to view the rocks on the outbound portion of the trip. 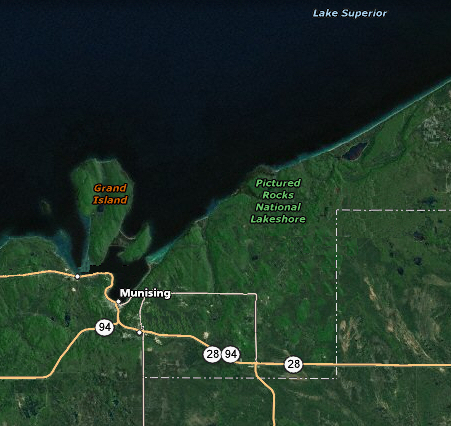 Yesterday a lightning strike started a forest fire north of Newberry, which is perhaps fifty miles east of Munising. This Upper Peninsula forest fire will burn for over a month and cover more than 18,000 acres within the Lake Superior State Forest. Lake Superior is the largest surface area freshwater lake in the world. The first French explorers approaching the great inland sea by way of the Ottawa River and Lake Huron referred to their discovery as le lac superieur. Properly translated, the expression means "Upper Lake," that is, the lake above Lake Huron It is the deepest and coldest of the five. 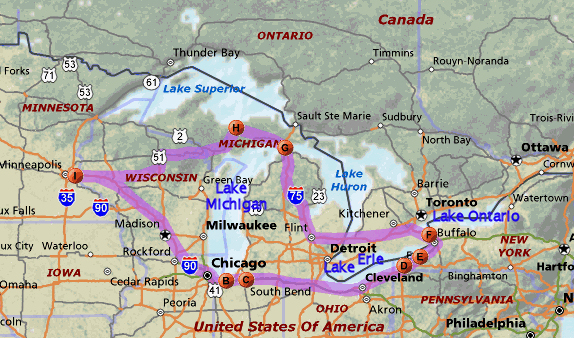 Superior could contain all the other Great Lakes and three more Lake Eries. Superior has a water retention time of 191 years. 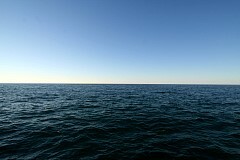 It's average depth is 483 feet while at it's deepest point its 1332 feet. Lake Superior drains into Lake Huron by the St. Marys River. The rapids on the river necessitate the Sault Locks (pronounced "soo"), a part of the Great Lakes Waterway, to move boats over the 25 foot height difference from Lake Huron. 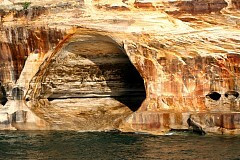 Private cruises for a water view of the Pictured Rocks operate from late May to mid October. They have three tour boats. The water was too rough earlier in the day so no tour boats have gone out all day. The first boat of the day turned back when they hit rough water. 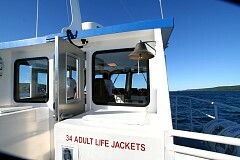 One of the deckhands told me the boats weren't in danger, but too many of the passengers would throw up in rough waves. The wind switched direction and died down so now all three boats are going out for one last trip this evening. 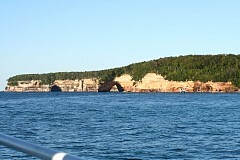 We are on the last boat, heading across Munising Bay. It's going to get chilly when the sun sets, but we forgot to bring warmer clothes. This is the Old East Channel Lighthouse on Grand Island. 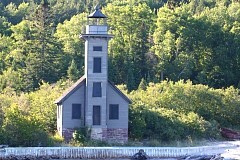 The light began service on the evening of August 15, 1868. 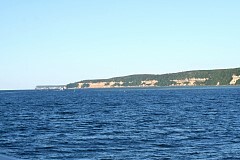 Munising Bay's south shore long served as a natural harbor of refuge to vessels seeking shelter from the fury of Superior's late season storms. By 1908 the light was obsolete and the venerable structure's fate was left to the elements. 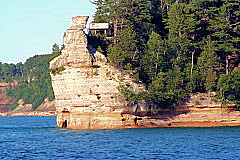 Miners Castle is the most famous formation of the Pictured Rocks, and in addition to being on the boat tour, it's accessible by vehicle and short trails. 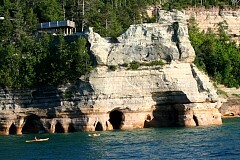 Supposedly Father Marquette would preach to Indians in their canoes below Miners Castle. 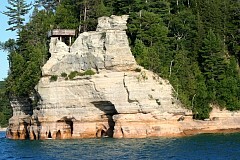 Miners Castle doesn't look the same as in the past - at least five major chunks of rock have fallen into Lake Superior over the past dozen years. 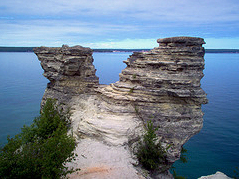 Just like the missing Table Rock and Cave of the Winds at Niagara Falls, future generations coming to Miners Castle will look upon the remnants of yet another named-but-missing natural feature. The wooden structure is an observation deck for use by those using the trail. 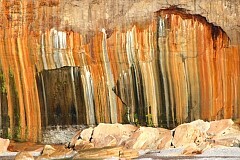 The major formations of Painted Pictures are Miner's Castle, Battleship Row, Indian Head, Lover's Leap, the Color Caves, Rainbow Cave, and Chapel Rock. These are historical pictures. 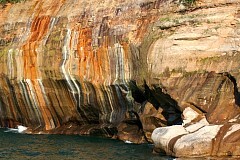 A rock fall in 2006 dramatically changed the look of Miners Castle. In the left-most picture opposite, the right formation of the two tumbled into the water on Thursday, April 13 2006. 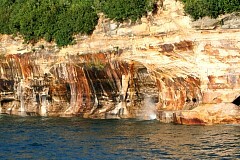 The name "Pictured Rocks" is due to the pictures that seem to appear on the rocks from the multicolored sandstone and mineral stains on the rock surface. 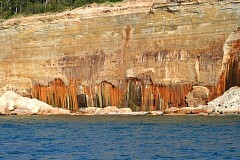 The cliffs are composed of Cambrian Sandstone, dating back about 500 million years. 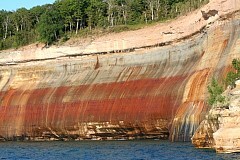 The stains on the sandstone are caused by water running down the cliffs filled with oxides of copper, manganese, iron, and organic minerals. 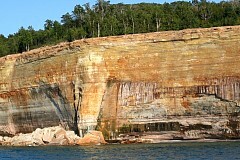 The cliffs rising 50 to 200 feet directly up from Lake Superior and stretch for about 15 miles. When this sandstone was formed, the only life on earth was found in the oceans, and the atmosphere was comprised of toxic gases instead of the air we breath today. 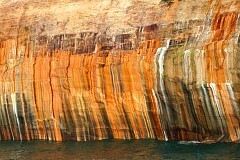 The cliff and rock formations of Pictured Rocks are constantly changing due to the action of wind, water and ice. Note the rubble at the base of this cliff. These particular stains appear to be iron. The North Country National Scenic Trail extends the length of the lakeshore, providing beautiful views along the trail for both backpackers and day hikers. We saw a handful of hikers during our voyage. 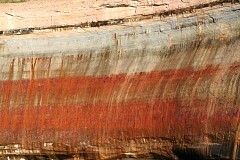 Mineral seepage creates the colors. Red and orange are copper oxides, green and blue are iron oxides, black is manganese oxide, and white is lime. I also thought I saw a turquois color. This formation is called Petit Portal. This shot is a camera nightmare, shadows, sunlight, odd angles etc. I am not retouching it - it is what it is. We move abreast then past this hole pounded into the base of the cliff. The left-most picture shows some spray generated by wave action.